Social networks significantly increase the need for tools to help organize and prioritize relationships because social networks have boosted the number and variety of relationships we have by an order of magnitude. For more background on this, see Social Networks and the Relationship Life Cycle: Myths and Realities. I’ve spent my whole career in “business to business” (B2B) and professional services, which is why I write extensively about trust and relationships. Digital social networks can be fantastic relationship accelerators, but only when people use them to develop relationships. Most people do not because they aren’t aware of how to develop relationships; they usually do it unconsciously. The stakes are high. B2B business deals are usually high ticket and high cost, so buyers and sellers incur significant risk when entering business relationships. Therefore, they try to mitigate risk by assessing how trustworthy the other parties are. More on this in this short video. This post will maintain a B2B business development context, but you can adapt it to other purposes with a little imagination. First, however, I have to qualify myself because I’m applying business concepts to business relationships, which makes some people uneasy when they perceive it as cold and “scientific.” I’ll ask you to temporarily suspend judgment on this because thinking differently is necessary to fully tap the potential of digital social networks; moreover, I’ll also explain that thinking about relationships this way need not be cold, calculating or false, even though it can be. You can be fully transparent and congruent while using this approach, when you are honest with people and never pretend something you’re not. The fact is that most people have far too many contacts with whom they could interact. The recurring excuse is, “I don’t have the time” which, although it may be well intentioned, is unilaterally false: people find the time when they understand the value of that interaction in terms of their goals. What they really mean is, “The potential payoff of the potential interaction is too low for me to incur the cost of pursuing it.” But that’s unconscious. And true. You will be most successful in building a high value network when you optimize the investment in each person, based on what your intention is with him/her and recognizing his/her intentions with you. When you are congruent. By the way, people have always made these types of calculations, but they have usually done it unconsciously. All we’re doing is making it conscious. Welcome to HumanOS. Don’t hesitate to ask someone their intentions with you if you are unsure. For example, even though I have detailed guidance for connecting with me on LinkedIn, most people don’t bother to read it, and they ask me to connect without saying why they want to. I don’t discriminate against them because most mean well but are too unconscious to realize the importance. But I ask them openly what made them think of me and what their vision is for how we can help each other (corresponds to the Interest Vector). Their response places them on the Trust Vector. By making these interactions more conscious, most people and teams dramatically increase their productivity because they are more congruent, productive and happy. When considering your LinkedIn Connections, for example, the easiest way to think about prioritizing how much attention you give each has to do with how relevant and trustworthy each Connection is. I’ll bet that you have been doing this for years, unconsciously. Consider the countless business networking events you attend every year. If you’re in B2B, even if you go to industry-specific conferences and local association meetings, I’ll wager that most people you meet fall in the middle of the “Interest Vector.” Most of the business cards you collect sit on your desk; you don’t follow up with them immediately because there isn’t a burning reason. Others are in completely unrelated fields, so you may even discard those business cards altogether. If you are lucky and know how to work the room, you might emerge from a two-hour business networking event with 2-4 business cards that are “hot.” Those contacts are high on the Interest Vector. The Trust Vector is even more unconscious for most people, but it’s also more powerful; it’s the “gut feel” vector. At the same networking event, you meet 1-2 people with whom you “really click” and probably 0.3-1 who rub you the wrong way. Most people fall within the middle of the Trust Vector, too.You don’t know them well enough to trust them or not. By the way, when you are used to using the Relationship Value Map, you start asking certain questions when you meet people, to try to determine their relevance to your goals (Interest Vector) but also their trustworthiness (Trust Vector) by introducing appropriate issues into the conversation. Quadrant I is low-interest and low-trust. By the way, I are assuming that low trust is due to not knowing someone well enough to trust them; you probably don’t want people whom you know and actively mistrust in your LinkedIn network, but each person handles this differently. Likewise for low interest people. However, Quadrant I is relatively low priority. Quadrant II people are high trust and low interest, so you interact with them in substantial ways to honor the trust you feel for them (which is usually reciprocated), but the sense of immediacy is lower in a business context. Also, the Trust Vector is usually connected with more personal or social aspects of your life because the “business” relevance is low. Expect this and go with it. Once you realize how valuable High-Trust people are, you can interact more appropriately. I think of High-Trust people as my “peripheral vision”; I can ask them anything and trust them to try to help—and to give diverse points of view. 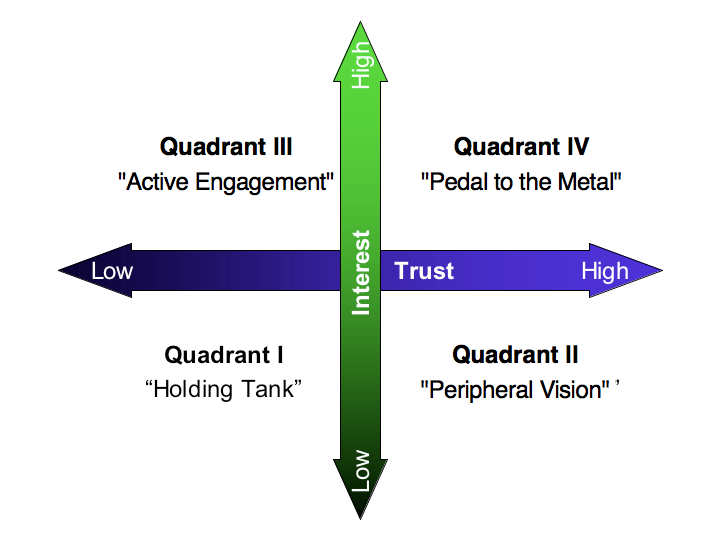 Quadrant III is high interest, low trust. These people are high priority, and you are very intentional about interacting with them in social networks in order to move them up or down the trust vector. By definition, when they move along far enough on the Trust Vector, they enter Quadrant IV. Remember, interacting in social networks is an order of magnitude faster and lower cost than more traditional interactions. When the level of trust is high enough for you, you transition to calls, video chats or physical meetings. Quadrant IV is your treasure trove. These are people for whom you throw everything down and interact when they need you for something. You have high trust and high interest with them. They are your individual “board of directors” whom you can pose your professional challenges, for they have relevant knowledge and high trust, so they are a fantastic resource for you, and vice versa. Most B2B executives will find LinkedIn most relevant in this context, so we’ll use it to show the Relationship Value Map in action. The process would be analogous in Twitter, Google+, Facebook or others. It’s also necessary to reevaluate your networks periodically because Connections are constantly flowing around the map. High trust Connections change careers and suddenly jump to Quadrant IV. Quadrant III people change careers and move to Quadrant II. The first step is to subdivide each vector with “milestones” that make sense to you. Our context is business relationships, so high trust might be “sign a deal with minimal contract protection.” Medium trust, I’d hire him/her without hesitation for a non-core service, contract or position. High interest may be, “If the person said s/he was in town and free for dinner, you’d cancel other plans to have dinner.” Etc. Make them meaningful to you. Start with three or four. Quadrant IV you want to engage regularly by responding to their LinkedIn updates, inviting them to answer questions you post in LinkedIn Answers. Consider starting a private Linkedin Group for only Q3 and Q4 people, and engage with them there by holding “closed door” discussions. Look at their LinkedIn Profiles regularly, review their activity and reach out with ideas you have for ways to help them, or share links with them. Quadrant III is much the same as Quadrant IV except it’s more opportunistic. You want to be committed to these Connections, but the level is less; there’s less rich dial tone. However, you’re in active exploration with them; pay close attention to how they respond to you. Consciously move them along the trust vector. Quadrant II you want to contact periodically, and even on LinkedIn consider inviting them to answer questions that have to do with more personal topics. 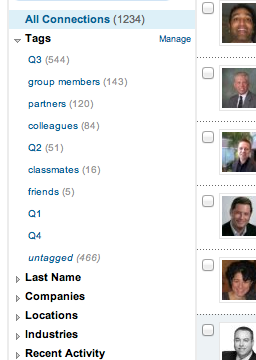 Share “lighter” or more personal links, especially on Fridays or weekends. Definitely be responsive to their LinkedIn updates. It is critical to get the vectors right so that the quadrants are the right portion of your total Connections. If you apply your “milestones” and end up with half your Connections in Quadrant III or IV, your milestones need tweaking. This is also a function of your time. If you are in B2B sales, your core function is developing new business, so make your milestones such that you have a bigger portion of Quadrant III and IV. Be attentive to the Trust Vector milestones, too. You may need to loosen your standards a bit if all your Connections crowd along the left side of the map ;^). Using the Relationship Value Map, even moderately, doubles or triples the value of most teams’ and individuals’ networks. CSRA designs complete LinkedIn programs for B2B sales teams to vet trust by designing interactions to do that, but that’s beyond the scope here. The bedrock of creating and maintaining satisfying and productive relationships is being congruent and transparent. The biggest trust killer is being fake. Don’t pretend to be Quadrant II or Quadrant IV with someone if the trust level isn’t there for you. Likewise, don’t let down your Quadrant II or Quadrant IV people, and sincerely fall on the sword when you do. Most people appreciate honesty and congruence because what they really value is predicting how you will act in certain situations. Unpredictable people are not as valuable as predictable people. Knowing what to expect of people is critical. This gets us back to trust. Trust isn’t universal; when you think about it, you trust certain people in certain situations, and you pursue ventures or interactions that are appropriate for your level of trust and interest. And they are doing the same with you, whether or not they (or you ;^) are aware of it. People get into trouble when they don’t judge the level of trust appropriately. Please post questions, thoughts and experiences in comments.